You don't get many large sets of action figures. It's a tough market, and most manufacturers play it safe by releasing series of four or five figures at a time - and maybe a two-pack if they're feeling adventurous. Character Options were evidently confident that the Doctor Who license had some serious selling power, and thus have made a veritable deluge of product, including this ten-figure gift set featuring characters and creatures from the TV show's first new season. The Doctor is a 900-year-old Time Lord who travels through time and space in search of the next great adventure with his companion and his fantastic time machine the TARDIS. Christopher Eccleston was in an unenviable position taking up the mantle of Doctor Who. Not only was the whole effort to restart the TV show, which had gone through so many hurdles and false starts, riding more or less entirely on his shoulders, but - our American readers may not be fully aware of the magnitude of this - on his home turf in the UK and the colonies, the Doctor is more important to the sci-fi community than Captain Kirk and Luke Skywalker combined, and woe betide any actor who falls short of the mark. Eccleston, luckily, was bloody brilliant. The first batch of Doctor Who figures to reach shelves tended to favour pose over articulation, and this Ninth Doctor is a good example of that. He's quite obviously intended to be aiming his sonic screwdriver dramatically off to his right, and any attempt to get him into another pose doesn't really work out. He has a swivel neck, peg shoulders and hips, swivel wrists, a swivel waist and pin elbows, but they're really only good for fine-tuning. Luckily the pose he's stuck in is a good one, and he looks great in it. The face is a terrific likeness, especially from the front, and the paint supports the sculpt admirably. Unlike his eccentrically-dressed predecessors, the Ninth Doctor favoured a subdued wardrobe of black pants, various dark t-shirts (burgundy here) and a black leather coat, all of which are reproduced faithfully. Once you accept that he's not meant to move, the only real drawback to this figure is that the boxed set doesn't include any accessories, leaving him flourishing a non-existent sonic screwdriver, which - if you don't have a spare one from another figure - is really very awkward. The Doctor has regenerated 10 times during his life. Each time changing his whole appearance and personality whilst still remaining essentially the same man. Actually he's regenerated nine times, since his first incarnation was the original Doctor, and the second Doctor was his first re-generation. Anyway, immediately post-regeneration the Tenth Doctor was still wearing his predecessor's clothes, so aptly enough what we have here is a Ninth Doctor figure with a new head. 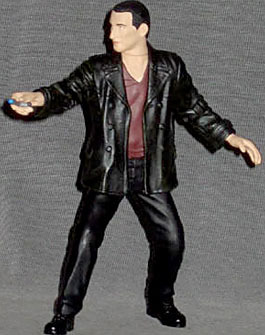 The body is the Ninth Doctor redux, without the pre-set pose and with a lot more articulation, so that's a positive - with peg shoulders and biceps, pin elbows, swivel wrists, a peg waist, peg hips, and pin knees, he's one of the more versatile figures in the Doctor Who range. The leather coat is soft plastic, so it doesn't impede the mobility of the legs at all - unfortunately, the coat tends to hang very flatly down the torso, so when you've got a small plastic action figure wearing it rather than a life-sized Christopher Eccleston, it lacks visual flair. In comparison to the Ninth Doctor figure in this set, this one is also lacking colour, since he's switched from a burgundy shirt to a black one. The head is a bit of a problem, sadly. In re-using the Ninth Doctor body, which has a swivel neck, they're also committed to the bottom of the Ninth Doctor's neck, and that's a bit thicker than David Tennant's. The head sculpt does its best to smooth the transition from neck to head, but there's still something subtly off about the proportions there, and it's difficult to ignore. The right hand is, of course, sculpted to hold the sonic screwdriver, but as with the Ninth Doctor, there ain't one in the set. Despite the irksome neck and the somewhat dull appearance, it's a decent enough figure, but if we're being honest it's one that only serious collectors will really want. Jack Harkness, a one-time intergalactic con man, joins the Doctor and Rose on their travels and becomes an integral part of the team for several adventures. Ah, Captain Jack, the poster boy for "This ain't your daddy's Doctor Who" - the combination of actor John Barrowman's bottomless reserves of charisma and Jack's effervescent omnisexuality made viewers sit up and take notice, and in many cases (male and female) start drooling. Heck, they even sit through lacklustre Torchwood episodes just to see him. Jack first appeared masquerading as an Air Force officer during the second world war, and that's the outfit he's attired in here. The single-colour uniform isn't the most flattering style, especially without the dark greatcoat Jack wore over it for most of his WWII stint, but it has its share of fine detail to make it look its best, with wings and insignia over the pocket, a shirt collar and bulky scarf visible through the open neck of the overshirt, and stripes on the shoulders. Awkwardly - as with so many of these boxed set figures - the right hand is sculpted to hold an accessory that isn't included, presumably Jack's sonic blaster. We can assume, though, that he's still got his Compact Laser Deluxe hidden away somewhere cozy. Barrowman's face isn't one of those ones with easily-recognisable physical traits, so it's doubly impressive that this figure sports such a good likeness of him. From the side it's close enough, but from the front it's exceptional, enhanced by the 1940s-style neatly parted haircut. Jack has a decent articulation set, with a swivel neck, peg shoulders and wrists, hinge elbows, a swivel waist, balljointed hips and pin knees. The high waist of the uniform makes the waist joint look a bit low, but it's nothing drastic, and the joint selection is good for a range of fine-tuning to make Jack look his best (as if he ever has trouble with that). The Sycorax are a warlike race of interplanetary scavengers. Travelling in a huge craft hewn from rock they terrify the planets they target and demand tribute in slaves. On Earth, they used blood control to apparently threaten mass suicide if their demands were not met. The Sycorax leader carries a staff and deadly whip. Though ruthless and quick to kill, they also have an honour code which allowed the Doctor to win Earth's freedom by defeating the Sycorax leader in combat. That needs a bit of clarification - they used blood control to threaten to make us commit mass suicide (everyone with A-positive blood, in fact), not themselves. It's difficult to imagine a belligerent alien race prospering by showing up to primitive worlds and threatening to off themselves if their demands aren't met. The Sycorax leader is a bit of a pack-rat evidently, which makes him quite a challenge to action figure makers - all the assorted bits and pieces of bone and talismans and whatnot he's got hanging off his person, plus the plethora of textures used on his wardrobe, would be more readily seen on one of McFarlane's insanely detailed statues than on a regular mass-market figure. 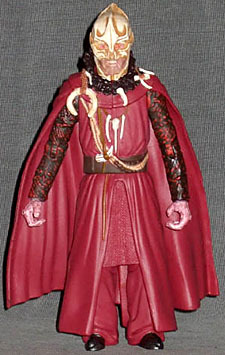 A credible effort has been made, but overall one has to admit that the Sycorax leader isn't the most successful Doctor Who figure, not due to lack of effort, but simply due to the limits of how much they're willing to spend on a single toy. There's a fair amount of texture and detail in the sculpt, and the paint does its best to keep up with a limited palette, but at this price point, the result was never going to be as good as it needed to be. That said, the figure isn't without merit - the head and face have clearly been prioritised, and are pretty good efforts with strong shading on the bone and good fine detail work around the eyes and mouth, with the teeth and tongue painted to emphasize the belligerent sneer he's sporting. Articulation is decent as well, with a swivel neck - the soft plastic peg allows the chin to travel over the soft cloak, so the range of motion is good - swivel shoulders, pin elbows, swivel wrists, a swivel waist, peg hips and pin knees, the leg joints likewise relatively unencumbered by the soft plastic skirts. The absence of accessories bites hard, however, with the hands very obviously intended to be holding the character's staff and whip - the staff especially would have enhanced the primal, sorcerous look of the leader considerably. The Daleks are the Doctor's ultimate enemy. Their outer shell is a battle armour inside which lurks a hideous mutant from your worst nightmares. The Dalek race was genetically engineered to remove every emotion - except hate. They despise all other living creatures and will exterminate without exception. Thinking he has destroyed them for good, the Doctor was appalled to find them in the far future very much alive and preparing to destroy the Earth. While that's true, it's a fair bet that those Daleks aren't this Dalek - the opening feature strongly links this toy to the Dalek seen in the episode "Dalek," which was only set in the near future. To be fair, it did seem to have the destruction of the Earth in mind as well, but Daleks are like that. It's simply not possible to overstate the importance of the Daleks to Doctor Who - the Master may be more of a classic nemesis, and other foes like the Cybermen may appeal more to some fans (like me), but when you get right down to it, the Daleks are where it's at when it comes to Doctor Who monsters. 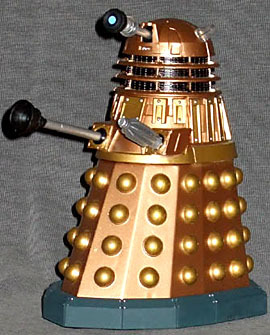 So any action figure line had better include a Dalek, and the Dalek had better be good - luckily, it does and it is. For their new appearances the Daleks' traditional silver has been upgraded to a copper/gold colour scheme that remains faithful to their metallic origins, but conveys a more menacing, more alien look. The toy Dalek reproduces the metallics quite well, along with finer details like the rivets on the gun platform and base, and the clear discs surrounding the eye stalk. The blue "eye" is a bit too sky-blue, but matching the tone of a bright light is a tough job, and while there's some minor coverage issues on the black vents beneath the head dome, they're nothing worth getting too upset about. Sadly this toy doesn't reproduce the Daleks' newest trick from the TV show, rotating the gun platform segment a full 360°, but otherwise it's got the necessary articulation, with a rotating head, a tilting eye stalk, and ball joints for both arms. The "death ray" is simplified by necessity, with the railings running parallel to the barrel represented by raised ridges, but the effect is good, and the sucker arm is likewise a good replica of the real thing, including the subtle detail on the sucker to indicate that it's not just a plunger. The Dalek moves about on two fixed rear wheels and a forward-mounted trolley wheel. This Dalek's unique feature is that the "chest" opens - not the complex process seen on the TV show, but a simpler mechanism of simply removing the front of the gun platform. 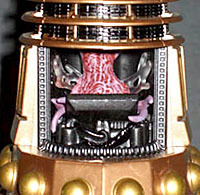 Inside, cradled in a combination of matte and gloss black components, is the Dalek creature, a misshapen blob of tentacled goop rendered in transparent plastic with pink and purple paints applied. It's missing a paint application for its single eye, but otherwise is a decent likeness for the current incarnation of the real thing - as much as their casings have remained relatively unchanged, Dalek creatures have varied wildly over the years - and it's sculpted very nicely, with its tentacles draped over the touch-screen controls of its machine body. The Autons are living plastic, shop mannequins that have been brought to life by the Nestene Consciousness, an alien viscous plastic life-form intent on engulfing Earth in order to feed its appetite for industrial waste. These days the average Doctor Who viewer may well have Saw or The Ring on their DVD shelf too, but back in 1970 the primary audience was still children, and the sight of shop dummies coming to life and gunning down shoppers in the street was so terrifying that debate over whether the show should be toned down even reached the House of Lords. Of course, the children in question liked being scared by the monsters, which is why the Autons - who appeared only twice prior to the new series - remain one of the show's most enduring monsters. The modern Auton has been updated to fit with today's mannequins, but in choosing the colourless, generically handsome look common to department stores, rather than the more realistic dummies that frequent fashion outlets, there's a strong link to the original Autons, with the same unfinished, unreal appearance. On the surface you'd think the Auton was an easy job for the sculptors and painters, but they haven't taken it as an excuse to be lazy - the shape of the head, down to the tilt of its chin and the stylised windswept hair, is spot on to one of the designs featured most prominently on TV. From its former life as a men's fashion model, the Auton has inherited a subdued but stylish black suit with an open jacket, creating a very striking contrast with its off-white "skin." Autons are armed with miniature blasters built into their right hands - the fingers (which are a single sculpted piece) flip down to reveal the barrel. The action figure doesn't quite duplicate this - the fingers are a separate piece, but they have a peg that plugs into the hand, rather than vice-versa, so that when they're removed the flat front of the hand sports a hole, not a rod that would resemble a gun barrel. One could easily be inserted in the hole, but as with all the figures in the boxed set, no accessories are provided. It's a minor shame, but regardless of that the Auton is a welcome tribute to a fan-favourite monster. The "Space Pig:" a genetically altered hoax alien creature created by the Slitheen, used to pilot a crashing spacecraft as a diversion from the real Slitheen invasion of Earth! Alright, let's be honest - this one's pretty silly. Aside from the space suit, he's basically just an anthropomorphised pig, who'd be more at home demonstrating the pitfalls of shoddy building practices vis-a-vis the big bad wolf than turning up in TV sci-fi. Then again, there really are alien races in Doctor Who that are just Earth animals standing upright - the Catkind for instance, or the Judoon - so maybe this guy is a genuinely accurate fake alien, and the joke's on us after all. Whatever the case, considerable effort has gone into making this pig in a space suit the best pig in a space suit he could possibly be - and that's a sentence I've never used before, and doubt I ever will again. The suit has a soft matte black finish that does a credible impression of the real thing, and the lustrous gold lock rings on the cuffs, ankles and neck, along with a couple of silver and gold studs on his chest unit, make for quite an effective colour scheme. The exposed head and trotters are bright pink, with sculpted texture and a light wash on the trotters to bring out the detail, plus painted nails, and a lot of paint attention on the eyes and snout. 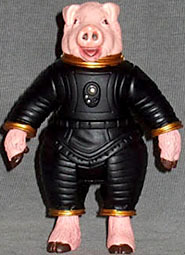 If there's anyone who desperately wanted an action figure of the Space Pig, they won't have cause to complain about the quality of this one. Surprisingly for such a small, stocky figure, he's also quite well articulated. His body dictates a goofy kind of look no matter what pose he's in, but with swivels at the neck, shoulders, wrists, waist, hips and ankles, he's capable of a fair amount of motion. A nice touch is that the lower jaw, being a separate piece, extends down over the neck joint without impeding its motion at all. All in all, he's a surprisingly fun figure, once you overcome the initial disbelief that he got made at all. The Slitheen are terrifying galactic scavengers who scrap entire planets then put their natural resources up for sale to the highest bidder. They use a "quirky" compression system to fit inside stolen human skins and disguise themselves. In an effort to distract the people of Earth from the fact that they've already been invaded... they crash an alien spacecraft right in the middle of London. The Slitheen (a family of Raxicoricofallapatorians) are more or less the first new "monsters" of the new Doctor Who, preceded only by the Autons (an old monster), Cassandra (a solo villain) and the Gelth (zombies plus special effects, basically). They're an odd-looking bunch - quite inventive, after a fashion, in that they don't look specifically threatening or evil, just... alien. Sure they have claws, but who doesn't in outer space - all in all though, if you saw one in the bathroom queue at Milliways, you wouldn't necessarily think anything of it. They don't look evil (like so many monsters), they just do evil. And fart a lot, though that's not so much evil as just a bit unpleasant. Your basic Slitheen is a big rotund thing - though quite quick for its bulk - and it's recreated fairly faithfully here. I'm not sure it's quite the size it should be - standing upright it's a touch taller than figures like the Ninth Doctor and Captain Jack, but not the eight-foot-tall it should be, and while it's certainly got the bulk to have a sense of physical presence, it doesn't loom over its human adversaries like it should. In all other regards there's nothing to complain about, with an artful sculpt capturing the creature's smooth skin - no look-at-me-I'm-evil armour plates or spikes - while still having enough detail in the form of wrinkles and sags to look realistic. The face is particularly nice, capturing the Slitheen in mid-yell, an expression that's spot on for the creatures' TV appearance. Articulation is a touch limited by the general proportions of the body, but they've made the best of what's available. The neck is a swivel joint - not as versatile as it could be, but it preserves the very visible sculpt down the back of the neck. Wrist joints are impossible, due to the exo-tendon (or whatever that is) running down the back of the forearm, but the hinge elbows and balljoint shoulders offer a fair range of possibilities with regard to menacing innocent bystanders. Balljoint hips and hinge knees make for sufficiently poseable legs, though I doubt you'd get the full extent of the Slitheen's loping run out of the figure. One thing to watch is the slouch in the legs - though stocky, they're not huge limbs compared to the bulk of the body, and they can easily be pushed down into their lowest crouch while posing the figure. They don't look bad, but with the scale issue, every bit of height counts, so make sure you have your Slitheen stood at full attention. The Empty Child is a small unearthly child with a gas mask face, who haunts London bomb sites at the height of the Blitz in 1941 in search of his mommy. The DVD cover for these episodes also referred to him as "an unearthly child," which suggests that the copy text department is well-stocked with knowledgeable Doctor Who fans with a penchant for in-jokes - "An Unearthly Child" was the first episode of Doctor Who, broadcast waaaay back in 1963. Though in that case, the child in question was Susan, who was a lot cuter and less, y'know, terrifying. The Child is a simple design, merely a child in a typical 1940s blazer and short trousers, wearing a gas mask. At just 3½" tall and lacking the bulk of the Space Pig, he's the smallest figure in the set. Regardless of that, he's not short on detail - the open collar of his shirt pokes out of the v-neck of his sweater, the sleeves of which are visible in the cuffs of his blazer, his shoes have the appropriate lacing and design, and the gas mask isn't short on realism. His articulation is limited but useful, with a swivel neck, peg shoulders, swivel wrists, peg hips and swivel shins - the right hand is pointing, in case you want to have him gesturing to some other unlucky figure and asking "Are you my mummy?" but since he's an eerie figure of fear rather than a kinetic action hero, he looks fine just standing there. The majority of his body is cast in the grey plastic used for the suit, but where there's paint it's well applied. There's a high-contract highlight on his hair, blonde over medium brown, which is quite effective and makes clear the black straps of the mask running over his head. The mask's eyes are painted a dark brown, rather than being transparent with a sculpt beneath them - so far as simplification goes, it's not the worst thing they could have done, and from a distance the tone of the brown, rimmed by the silver edges of the eyeglasses, looks reasonably convincing. All in all, the figure is a good, if simple, reproduction of one of Doctor Who's most unsettling "monsters." 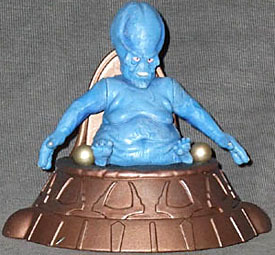 The Moxx of Balhoon is a small blue-skinned alien with large head and withered body. The highly intelligent Moxx met the Doctor and Rose on a space station orbiting the dying planet Earth in the far future. The Moxx travels around on a special highly maneuverable cushioned hi-tech chair. When the space station's sun filters failed, it allowed the sun's deadly rays to incinerate the poor Moxx. The final figure of the set is arguably its most incidental - he's not a hero or a villain or a ravenous critter, and he didn't even smash a star cruiser through Big Ben like the Space Pig did - but he's fun. The gathering of dignitaries on Platform One in "The End of the World" served as a kind of classy version of the Star Wars Cantina scene, to show off what the new show could do in terms of a dizzying variety of technicolour alien life. 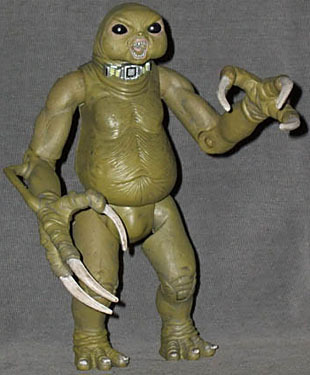 And much like the particular appeal all the Cantina-originated Star Wars figures have, the Moxx is fun not because of anything he did (which was basically sneer a lot, then roast), but just because he's one of the strange, strange creatures that wowed us when we saw them. The Moxx and his chair are a single piece, and as you'd expect from looking at him, he's not the most articulated of action figures. Neck and shoulder swivels are the lot, limiting him to glaring around a bit (there's about thirty degrees of turn to either side on his neck) - he can't even put his hands on the control spheres of his chair, which is a bit disappointing. On the plus side, to make up for his static appearance, the makers have given him an action feature to ensure he needn't be truly static - the rear wheels concealed under his chair are tension-fitted, so you can pull him back and then watch him trundle belligerently across your desk. It ain't rocket science, but it's cute. With not much versatility, the Moxx makes up for it in looks - not attractive looks, but he can't help that. His basic blue is augmented by a well-judged highlight, which brings out the subtle detail of the body sculpt without going overboard, and the little details like his eyes, teeth and nails are all cleanly applied. His chair is an effective sculpt in copper-tinted plastic, with burnished gold to pick out the control spheres, and a painted texture over the cushion he's sitting on. He may have only lasted part of one episode, but he's got an action figure his brother (the Elth of Balhoon) would be happy to have him commemorated by. As a complete set, the Season One gift set - like most boxed sets - has its ups and downs. It's a cheap (per figure) way of getting a good spread of figures, and with most of the first season's selection of single carded figures now hard to find, this box will fill in the gaps of many a recently-begun collection. There are a couple of weak spots (the Sycorax leader really isn't that great, the regenerated Tenth Doctor is of limited value since he's basically wearing the wrong clothes, and I'm not sure anyone really needed a Space Pig), the lack of accessories is a sore point, and I would've liked to see more balljoint necks (luckily, Character Options has been going that route with more recent figures). But for what you pay, you get a generally great selection of figures, with classics like the Dalek and the Auton, new favourites like Captain Jack and the Slitheen, and some Doctor Who eccentricity like the Empty Child and the Moxx. All in all, it's a solid set of figures, and well worthwhile for fans.